Pay attention. Very close attention. If you do not. You will miss it. Serving up grind metal is a job best left to Shane Embury (NAPALM DEATH). He has delivered yet again with his newest project, BORN TO MURDER THE WORLD. 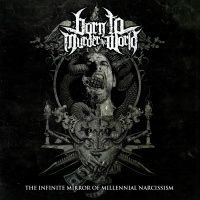 Based out of Birmingham England BORN TO MURDER THE WORLD is set to release “The Infinite Mirror Of Millennial Narcissism” via Shane’s Noise/Grind/Experimental label Extrinsic Recordings on August 24th 2018. Here is why I told you to pay attention, this is a grind album in true form. These tracks are short, very short, and before you even know it, the album is over. “Brutality Alchemist”, the albums 2nd track, starts in with a rock style riff and quickly becomes a monstrous train barreling down the tracks. The vocals range from low death to chocking, gargling screams. The music is fast, direct and to the point. “Genesis Misconception” has a vocal style that seems to have drawn influence from THE ACCUSED. The guitar lines can seem totally simplistic and then have a bipolar change into technical mania. When the band in unison preforms dynamic stabs the sound is as thick as FEAR FACTORY. Had it not been for the band not listing a drummer, rather a programmer, I would have had no idea the drums weren’t organically played. Between tracks are atmospheric noises, almost industrial sounds, and glitches that actually fit the direction of the track prior and lead into the track to come. The production value is as good as the best groove metal bands deliver it. Thick, heavy, and full, yet, clean and crisp. This is everything you would expect considering the talent and resume of the members. So go on and set your expectations high, they will be met. Just be ready when you go to hit play and begin listening to “The Infinite Mirror Of Millennial Narcissism” because like I said, in true grind form, it is over quick.